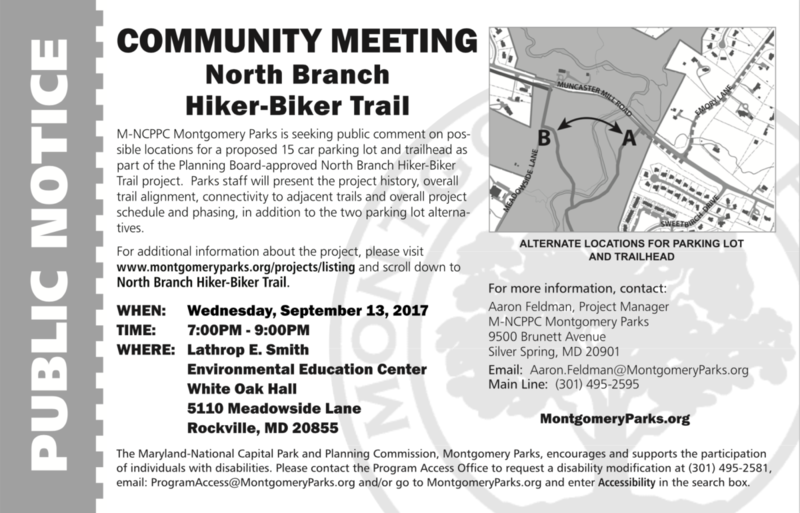 M-NCPPC Montgomery Parks is seeking public comment on possible locations for a proposed 15 car parking lot and trail head as part of the Planning Board-approved North Branch Hiker-Biker Trail project. Parks staff will present the project history, overall trail alignment, connectivity to adjacent trails and overall project schedule and phasing, in addition to the two-parking lot alternatives. For additional information on accessibility to the parks and access programs, please visit MontgomeryParks.org and search park projects. Montgomery Parks, part of the Maryland-National Capital Park and Planning Commission, encourages and supports the participation of individuals with disabilities. Please contact the Program Access Office to request a disability accommodation.